Lizzee Solomon (Mutual Paradise) - Mutual Paradise is a comic zine by Lizzee Solomon, first published in 2011 on a semi-regular basis. 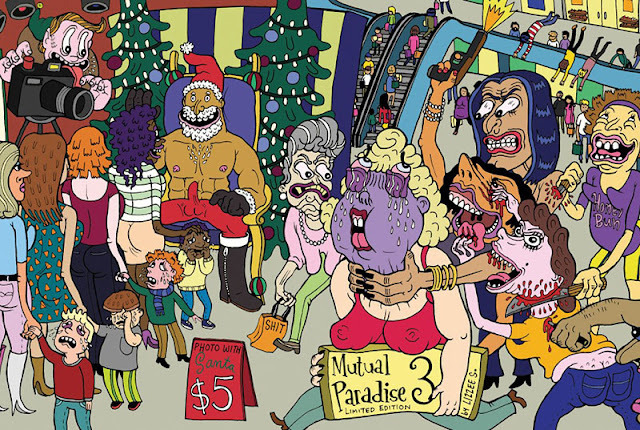 Mutual Paradise is kitschy, tacky, fetishistic, gross, vibrant, horrific and tropical. It might make you throw up, get a hard-on, write enraged Tweets, or take a huge dump. Some people who have seen Mutual Paradise have accused Lizzee of objectifying women. Her response is usually, “Uhhh, okay."